The City of Mount Dora, located on a plateau overlooking Lakes Dora, Gertrude and Beauclair, has a fascinating heritage. The town site was settled on the two hundred homestead acres of William and Annie Stone when they came to the area about 1873. At first the settlement had no name but in 1880 it became Royellou, for Roy, Ella, and Tremain, the children of Ross Tremain, the first postmaster. The first real estate sales office opened in 1882, and the Mount Dora Hotel opened a year or so later. In 1884, Alexander and Rhodes opened the first store and in 1886 came C. M. Stowe grocery. Mount Dora is indirectly named for Dora Ann Drawdy, 1819-1885, who lived on the lake and befriended government surveyors. They named the lake for her, and in 1883 the name was extended to the town. Mrs. Dawdy is buried in Umatilla, with a headstone that tells her name but doesn't mention her place in history. On March 25, 1910, the town was granted a charter with Captain J.P. Donnelly its first Mayor. At that time Mount Dora had a population of 371, with two general stores, a hardware store, drug store, livery stable, two churches and a town hall. Its first newspaper, the Mount Dora Voice, appeared in 1886. In 1891 R.C. Tremain and son built the first orange packing house, but the surrounding groves were all but destroyed by the 1894-1895 freeze. In March 1993 the "Storm of the Century" ripped into Mount Dora, killed two people, injured dozens, felled trees and damaged buildings. However a full recovery was made and few scars remain. 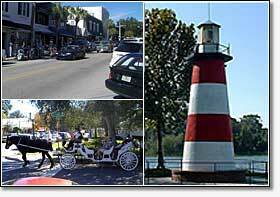 With a current population of about 15,000 Mount Dora is a growing city and a popular tourist destination. The historical information provided on this page was obtained from the book entitled "Lake County Florida - A Pictorial History" by Emmett Peter Jr. This book is available from the City of Eustis Library, 120 N. Center Street, Eustis, Florida 32726.